Tellurian Inc. (TELL - Free Report)	recently launched a shipper solicitation for the Permian Global Access Pipeline (PGAP) project through its subsidiary Permian Global Access Pipeline LLC. The interstate natural gas pipeline will connect the Waha Hub in Pecos County, TX to Gillis, LA. The pipeline, with 42-inch diameter, will ship 2 billion cubic feet of natural gas per day (Bcf/d). The open season will end on May 24, 2019. The pipeline project makes great sense as the natural gas prices at the Waha hub plunged to negative $3.38 per Million British Thermal Unit recently. The $3.7-billion pipeline project will help producers in the Permian Basin, where production has overpowered the takeaway capacity over the last few quarters, to reach the growing natural gas markets of Southwest Louisiana. The project, whose construction works are scheduled for 2021, will come online in 2023. Takeaway capacity constraints, which have created bottlenecks in the Permian Basin, will get softened by the time PGAP comes online. Still, the project is expected to witness significant demand as production is anticipated to grow rapidly in the region. Notably, the PGAP project is a remarkable chunk of the company’s proposed $7.3 billion network of pipelines. The network is anticipated to create 15,000 jobs in Louisiana and Texas. The company also has plans of building a $15.2-billion Driftwood LNG export facility near Lake Charles. Last week, Tellurian reached an agreement in Shanghai with TOTAL S.A. (TOT - Free Report)	to boost Driftwood's prospects. With global demand for cleaner energy sources rapidly increasing, Tellurian’s infrastructural investments can help the company to tap into a vast resource of profits. Several other oil and natural gas projects from different companies are also in the race to provide shipping capacity to producers. NAmerico Energy expects natural gas production from the Permian region to exceed the 20 Bcf/d level by 2025. In this regard, it is building the Pecos Trail Pipeline to provide additional shipping capacity. Also, midstream giant Kinder Morgan, Inc. (KMI - Free Report)	is building the Gulf Coast Express Pipeline Project that will have a shipping capacity of 2 Bcf/d. 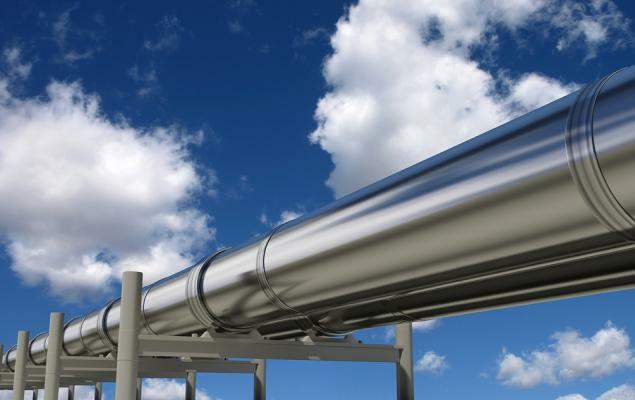 The pipeline is scheduled to come online in the fourth quarter of this year. Similarly, to support the increasing crude oil production from the area, several midstream investments in the region are underway. The largest publicly-traded energy company, Exxon Mobil Corporation (XOM - Free Report)	has created a joint venture with Houston-based Plains All American Pipeline to create a Gulf Coast-bound 1 million barrel per day oil pipeline, which is expected to come online in first-half 2021. Houston, TX-based Tellurian has gained 27.9% in the past year against the 15.1% collective decline of the industry it belongs to. The company currently has a Zacks Rank #3 (Hold). You can see the complete list of today’s Zacks #1 Rank (Strong Buy) stocks here.